Again, I was super excited to hear about this release. I had never seen this one. For some reason, it passed me by throughout my movie viewing life. More shocking is that Vincent Price stars in it and I am a huge Price fan, so I was happy to finally get to see it. Also, getting to see it on a high-quality Blu-ray is more fantastic. Twilight Time has done another amazing job bringing this B-grade Cult Classic Drive-In movie to a high quality Blu-ray and in 3D. As I have stated starring one of the true masters of Horror, Vincent Price. Price, really needs no introduction to anyone calling themselves a movie lover. He was the very definition of performance in no matter what role he played. From drama, to horror, he was the guru of cinema. Most fans flock to and collect his horror films for they were a true trademark, of Price. Price was so much more than just a horror actor. Prince was a skilled thespian. Price was an actor that could hold the audience, and give them a sense of personal dread and personal drama in the belief of his character. He plays the part of Don Gallico and Gallico the Great in this film and is solid with acting perfection. Starring as equally important John Emery. Emery was a true master talent and thespian of the cinema world. Starring in some of the great films of all time. He played the character Dr. Fleurot in the wonderful film-noir 1945’s Spellbound. The wonderful character of Jean in the classic Ingrid Bergman film 1948’s Joan of Arc. He also starred in some of the great B-Grade Sci-fi Films Drive-in style films Rocketship X-M from 1950 and one of my personal B-movie favorites Kronos (1957). Also, starring two very gifted beauties Mary Murphy and Eva Gabor. Mary Murphy was a true goddess of cinema. A true actress that shined. Mary Murphy went through the ringer of character actress or actress filling in small parts that meant basically nothing for a while, but ended up being a true leading lady beside some of the greats. Starring in such greats as 1953’s The Wild One with the great Marlon Brando. With the amazing Tony Curtis in 1954’s Beachhead and so many more. Eva Gabor was equally important and equally a true beauty. A soul that could create and master any film small or great with total perfection. Working in over 80 performances. Many know her sister with greater knowledge Zsa Zsa Gabor, but I feel Eva was of greater talent. Working not only in film, but also as a voice actor in such Disney classics 1970’s The AristoCats, 1977’s The Rescuers. She worked and starred in such great films as 1958’s Gigi. Many will know her from TV shows like Petticoat Junction, and her most famous role as Lisa Douglas in the long running sitcom comedy classic Green Acres. She was a beauty and shined in just anything she did. Directed by one of the forgotten greats John Brahm. Started directing in 1932 and stepped away from the craft in 1967. He would pass away in 1982. He not only directed films but he directed TV films and series. He directed such great television as the original Outer Limits, and the original Twilight Light Zone. He directed one of my favorite Horror mysteries and an all-around import piece of cinema period and is one of those films that should always be remembered and respected, 1944’s classic The Lodger. He also directed a wonderful drama 1952’s The Miracle of Our Lady of Fatima. This movie was written by an equally important persona in the film world. The one and only actor, writer and director Crane Wilbur. Wilbur was a true visionary and pioneer of screen writing. He wrote over 80 screenplays for film and TV and he acted in well over 80 performances, and directed well over 30 films. He was a man of many talents and created memorable pieces of cinema including this one I am reviewing, brought out and honored in loving detail by the company Twilight Time. He wrote many wonderful films such as the horror great 1953’s House of Wax, also starring Vincent Price. He wrote the screenplay for 1961’s Mysterious Island which also has been brought out on a lovely Twilight Time Blu-ray release. He also wrote and directed 1959’s The Bat, also starring Vincent Price. He also wrote another film that Twilight Time lovingly brought out on Special Edition Blu-ray, Solomon and Sheba. A fun and glorious 1954 horror film. A great film restored and lovingly brought out on a new worthy outlet to praise. This is a golden ticket. Twilight Time not only gives you the standard 2D version, but also you get the wonderful 3D version. This great B-grade, drive-in style, cult, late-night mystery is about a magician who murders one of his greedy employers who just happens to own all his tricks, but soon he finds that he must continue to murder to conceal and control his present and his future. Brilliant as always. Wonderfully produced product. High quality Blu-ray. Absolutely an amazing transfer to High Definition 1080P. The imagery is crisp black and white and vibrant in tone. The sound is total crystal clarity. That is something that almost always stands out with Twilight Time products. They do amazing job to these older films or at least try's to give the best quality possible. Isolated Music Track: The music is composed by Emil Newman and Arthur Lange. Emil Newman was a prolific master of music. A conductor that worked on many countless films and TV programs; well over 200 programs. What is so great about Newman is he worked on so many favorites of mine. I am a huge B-Movie lover, and B-movie film collector, he worked on many B-movie style films, pinpointing him as the music director for the classic 1942’s The Undying Monster is perfection. Newman has composed the music for so many styles of film. He worked on one of my favorites, Woman on the Run. This 1950 film noir is another prime example of capturing flawless cinema. Starring the beautiful, multi-talented Ann Sheridan, the brilliant Dennis O’Keefe, Robert Keith and Ross Elliott. 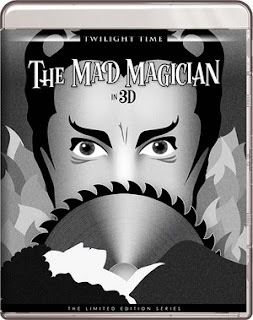 Newman added his brilliance to many wonderful films and The Mad Magician is one of them. Second on the music reality is the equally amazing Arthur Lange. An amazing composer of a vast array of important and popular music of his day and even to this day his music shines as one looks back on his brilliance in film. Working on well over 100 films. Starting in 1929 and working till his death in 1956. It was great to hear this extra that Twilight Time supplied. Audio Commentary by Film Historians David Del Valle and Steven Peros. A wonderful listen. Always amazing to hear from film historians. Always amazing to get great knowledge on the ideas and historical realities of the films being talked about. you need for this. Stooges equal perfection. Another amazing journey into a spotless product in transfer and imagery and special features. Twilight Time is amazing. A perfect example of another must own product. High quality Blu-ray.